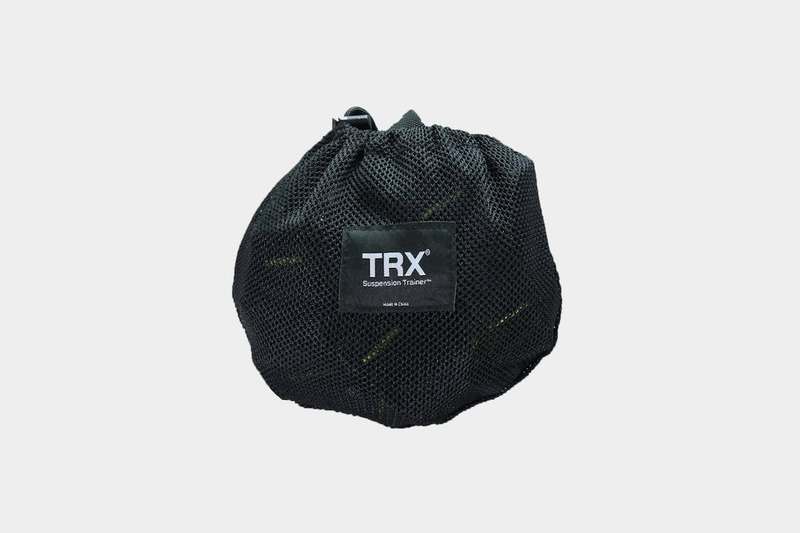 The TRX Go Suspension Training Kit offers a unique alternative to hotel gyms while traveling (or lack thereof) and other heavy duty weightlifting gear. There’s no doubt about it: staying in shape during long term travel can be complicated work. Until someone invents barbells with an anti-gravity setting, the options for all-inclusive mobile gyms will continue to be limited. In the realm of travel fitness, bodyweight-only training is a popular option. This type of training is time-efficient and can be done anywhere without access to specialized equipment, which makes it an enticing option for digital nomads and frequent travelers. One problem with bodyweight-only workout programs is that they tend to put too much emphasis on ‘pushing’ exercises for the front side of the body (e.g. push ups) while neglecting ‘pulling’ exercises for the back muscles (e.g. pull ups and rows). Overemphasizing pushing exercises for long periods of time can lead to muscle imbalances, poor posture, and eventually pain and injury in the shoulders, neck and upper back. If any of this applies to you or you are someone who sits a lot or who carries around a heavy backpack, pulling exercises are your friend. Many of us are constantly on the move and can’t count on having consistent access to the equipment we need to give our pulling muscles a good workout. So what’s the solution? Suspension trainers. 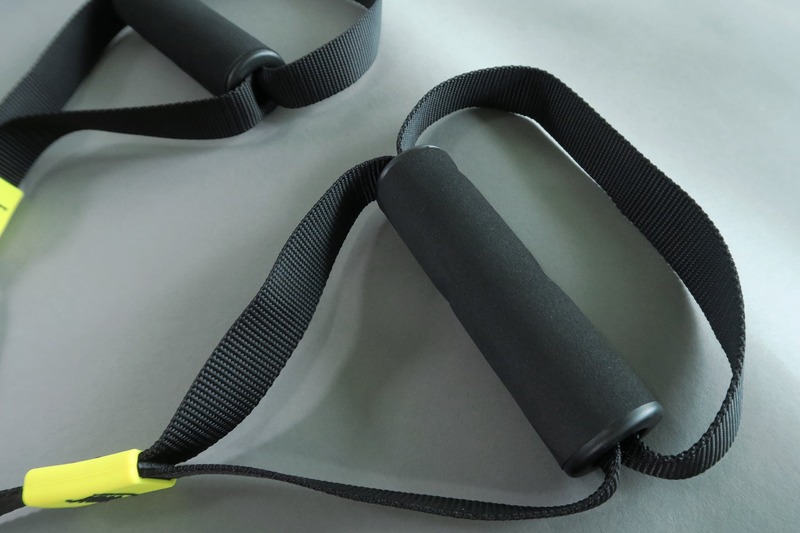 They are a lightweight, packable option that combines anchored ropes or straps to allow you to work your back muscles much more efficiently than you could with bodyweight exercises alone. There are lots of suspension trainers out there, but the portable TRX Go is specifically intended for travelers. The TRX Go is the lighter and lower cost alternative to the traditional TRX suspension trainers found in gyms around the world. With its thinner mesh straps and lightweight handles, the Go weighs 20.9 oz and, when rolled up into its mesh storage case, measures approximately 7“ x 5“ x 4”. This is a large and fairly heavy addition to lighter packs, but for extended trips and periods of limited access to gyms, it’s worth the added weight to help keep your back and shoulders healthy. Despite its lower cost, the all around build quality of the TRX Go is solid. 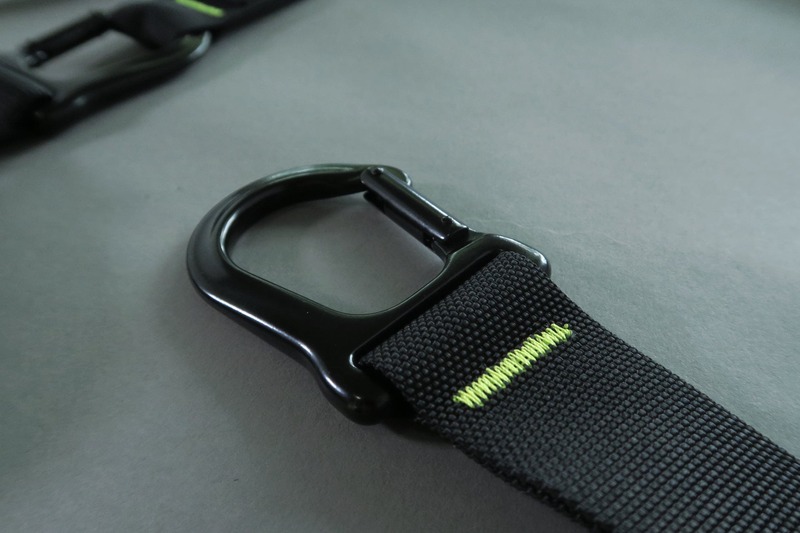 The carabiners are light, but feel sturdy and stable during exercise sessions. 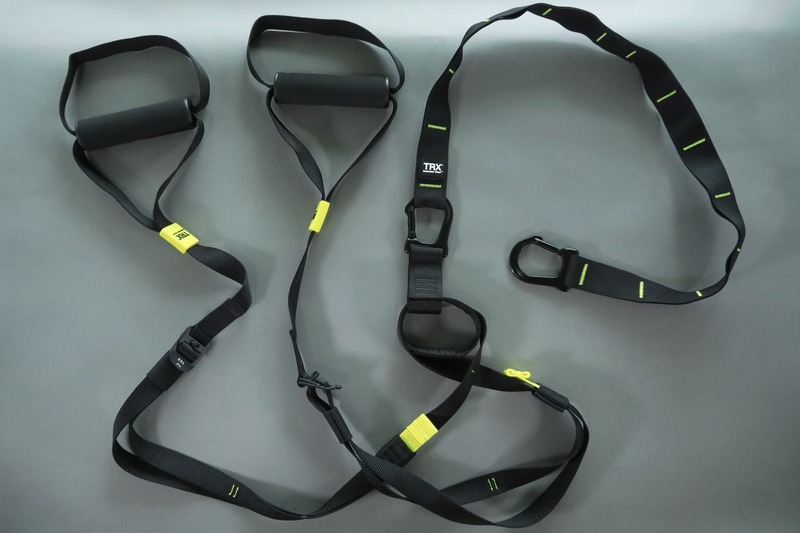 The straps and anchors are made of heavy duty mesh and are very similar in quality to the TRX trainers found in commercial gyms. The handles are comfortable and grippy with just the right amount of padding. They are intended to absorb sweat and therefore may retain odor, but your hands do not slip around during a workout—even during heavy sweating. Once anchored, the length of the straps and anchor height can be adjusted directly allowing you to customize the height of the handles for different exercises. TRX recommends anchoring the Go at least 7-9ft off the ground and adjusting the straps so that the handles are suspended at a height of 3in. Once you have the hang of adjusting the straps to get them to the right height, the setup and takedown process should take no more than 1 or 2 minutes. Another great thing about the TRX Go is the convenience factor. If you have access to a door that closes securely and 6-10ft of space in front of it, you can easily set it up in your hotel room or Airbnb. Noise considerations in hotel and Airbnb settings are also low with the TRX, as most of the exercises involve minimal ground impact. If you don’t have access to a doorway, you’ll also have the option to attach the TRX to sturdy, stationary objects like tree trunks or structural columns using the provided suspension anchor. 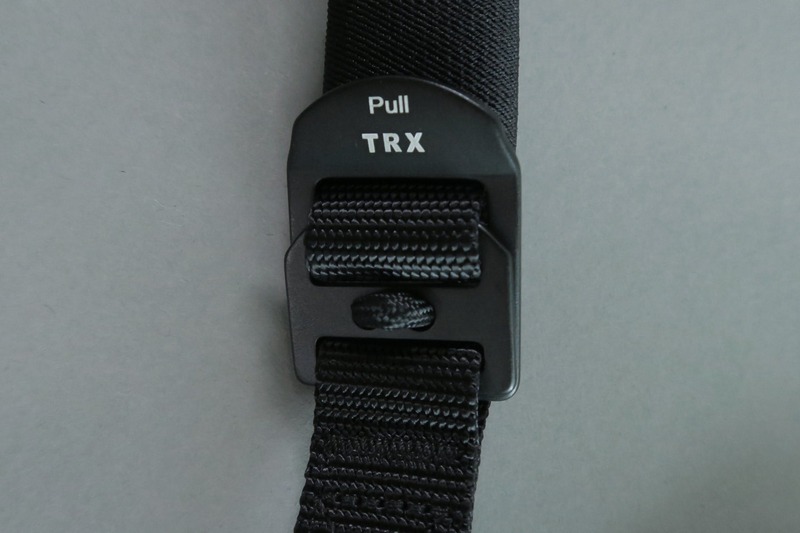 This means you can use the TRX for extended camping or hiking trips or in remote areas without safe, indoor attachment points. This will be annoying if you are at a slightly more advanced training stage, but won’t be an issue for most exercises. Depending on your footwear and the floor surface you’re exercising on, you may experience some slipping and sliding around during certain exercises. We’ve found this to be a particular problem on hardwood and tile floors. You may need a yoga mat or other lightweight alternative to avoid slipping. Packing up the TRX Go when it’s not in use is pretty straightforward. If you’re feeling lazy, you can just roll it up however you want and it will fit into the mesh carrying case. The carrying case can be compressed slightly using the drawstring. If you’re looking to save space and increase packing efficiency, try detaching the doorway anchor and wrapping the straps around the handles. 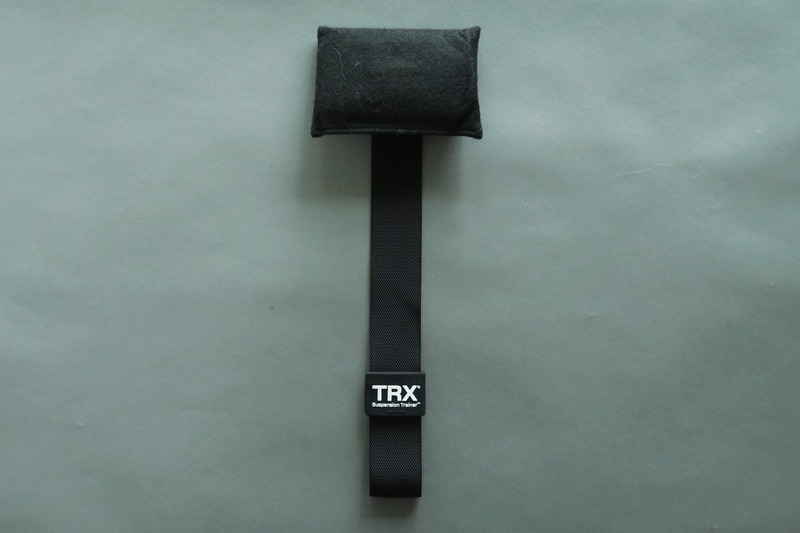 This will make the TRX more symmetrical and easier to fit into your pack. 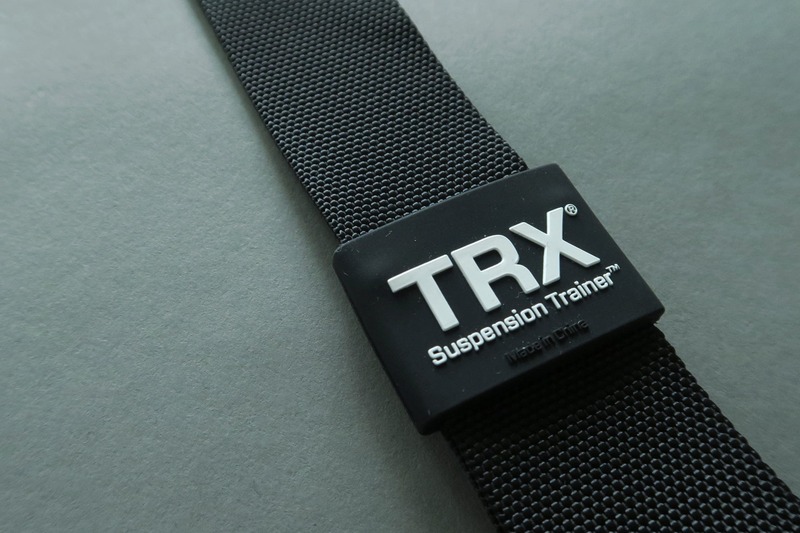 Included with the product kit is a card to register your TRX, which will also grant you access to videos with setup instructions as well as several workout routines and exercise guidelines. The videos are good quality and the setup instructions are clear and accessible, so we’d highly recommend checking them out when you are first starting out. If you struggle with this exercise, raise your starting position so that your body is more vertical. The lower you are to the ground, the more challenging the exercise will be. If you’re already pretty strong, you can also try weaving one strap through the other and doing the one arm-version of this exercise. A great starting point is 3 sets of 8-12 for rows. Make this exercise easier by standing up straighter or make it harder by lowering yourself in the starting position so that you are closer to the ground. Shoot for 3 sets of 5 (one T-Y-I is one repetition) with perfect form. The product feels sturdy and straps are stable with no structural defects. Foam handles are comfortable and in good condition. No discernable sweat odor after a few moderate intensity workouts. Product has stood up very well to weekly exercise sessions without developing any noticeable signs of wear and tear. The foam padding on the handles does have a slight sweat odor, but it’s hardly noticeable even during workouts. Adds balance to traditional bodyweight routines that typically overemphasize pushing exercises. Sets up anywhere with a door that fully closes or a sturdy overhead object like a tree. Lighter than other suspension trainers and multi-use workout devices. Sweat absorbing foam pads might retain odor and wear out over time, especially if your hands are prone to sweating. Attaching to a doorway limits the ranges of motion you can use for certain exercises. The TRX Go Suspension Trainer is a great, lightweight option for travelers and digital nomads who are looking for a balanced workout routine that they can do anywhere. Despite some minor durability concerns and practical limitations for indoor use, this is a great pack addition for health and fitness-minded travelers.